Puka Dog serves Hawaiian-style hot dogs. Their veggie dog is made with non-GMO soy. To make it vegan, be sure to eliminate step #2 (the garlic lemon secret sauce is not vegan). The relishes and mustards are vegan! 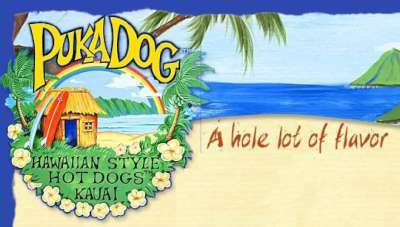 There is also a Puka Dog in Hanalei in the Ching Young Village.